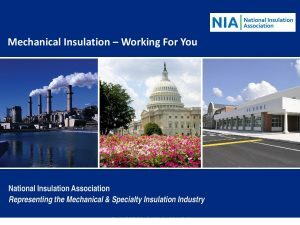 NIA has developed an insulation awareness presentation tool for our members. This PowerPoint presentation will help members express the benefits of mechanical insulation to a variety of audiences, including both experts and those with less knowledge about insulation. The presentation will be provided to NIA members as a complimentary member benefit and it can easily be used alongside many of the existing NIA educational materials. If members are looking to add even more value to their presentations, we have also developed a resource kit with a variety of materials including, the presentation, The Power of Insulation: A Proven Energy-Saving Solution brochure, NIA’s Insulation Materials Specification Guide, industry flyers, industry case studies, the NIA Insulation Sampler, Insulation Outlook magazine issues with articles specifically tailored for your audience, and various other industry materials. Some of these materials can also be placed on thumb drives if requested for a small additional cost. For members interested in a speaker, we are also offering a package that will provide a NIA presenter to deliver the presentation. Whatever your needs are, NIA can offer a solution tailored to your request. Note: Cost includes travel and kit fees. For more information about the Mechanical Insulation Awareness Presentation and Packages please contact Aimee Doyle, Assistant Manager of Membership Services, at products@insulation.org or 703-464-6422, ext. 113. 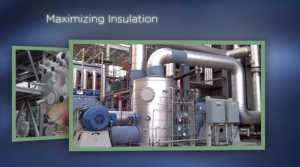 Created by the Southwestern Insulation Contractors Association (SWICA), this video demonstrates the importance of properly insulating mechanical systems and the difference mechanical insulation can make to a company’s bottom line, system efficiency, emissions reduction, workplace improvement, the environment, and U.S. job growth.